Social Media Tool: Salute, YouTube! Last week we released the news about adding Instagram to our lineup of social media channels. Well, video content is an integral part of the online world, too. And now you can get a heads-up on all the changes that have occurred in the realm of YouTube through SEMrush. Since 2005, YouTube has provided a forum for people to connect with, inform, and inspire others around the world, bringing together creators, advertisers and consumers. 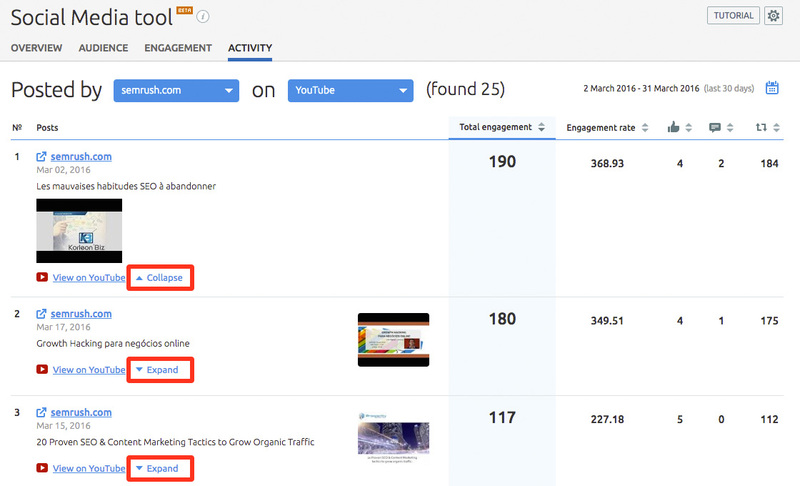 Now that we’ve added YouTube analytics to the Social Media tool, you can get data on your competitors’ YouTube channels and compare the results in all available reports. In the Overview report you’ll see the number of channel subscribers on the last day of the selected time period, along with the number of videos posted. You’ll also see their total of likes, views and comments for the specific video, and a measure of how much the audience engaged with the it Make sure you take advantage of the comparison graph, which compares your online social media activity to one of your competitors’ using such metrics as audience, activity and engagement. The Audience report will provide you with a detailed audience comparison overview for your company and selected competitors on YouTube - either by total audience or a particular social media service. The Engagement report gives you a total engagement sum specifying the number of likes, views and comments during a chosen time frame. And the Activity report shows a list of all the posted videos within a set period of time with options of expanding/collapsing on each video or watching it directly on YouTube, which allows you to get a much better understanding of how successful your or your competitors’ video content efforts are. 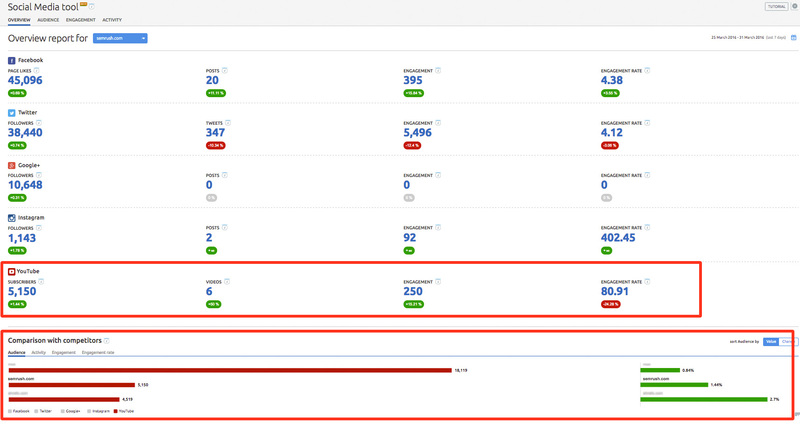 There’s also an option of filtering the results by the engagement rate, number of likes, comments and shares. YouTube was originally created for end users like posting your favorite clips, jokes and songs. Nowadays companies create their own YouTube accounts to reach potential customers with advertisements and other marketing videos. We hope you like this update. Please let us know if you have any ideas or suggestions for the Social Media tool by sending us an email at [email protected].